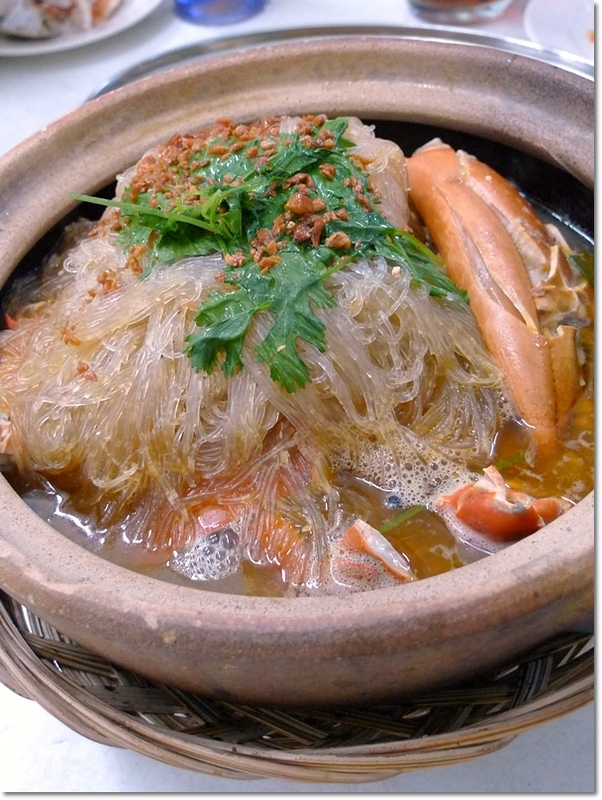 Famous Claypot Crab Tang Hoon (Glass vermicelli noodles/Bean thread noodles) – This pot is supposedly for TWO pax. But definitely more than enough, since the five of us were struggling to finish the two pots. Rasa Lain Restaurant is definitely one of the most famous Chinese seafood restaurants in Ipoh; renowned for their crabs in claypot (served with either rice or ‘tang hoon‘), claypot cheese prawns (sinful enough?) and homemade fish balls the size of a golf ball. Then Same Taste came along not long ago, and the storyline got convoluted somehow. Which one was the original “Tung Fun Hai” in Bercham? And now ….. for the past year or so, Different Taste Restaurant arrived at the scene. A single shoplot located inconspicuously within some residential area a short distance away from the famous Shine Noodles (Bercham famous wan tan mee with prawn dumplings), the owner is the elder brother of Rasa Lain’s owner. And this man’s wife was previously at Same Taste. 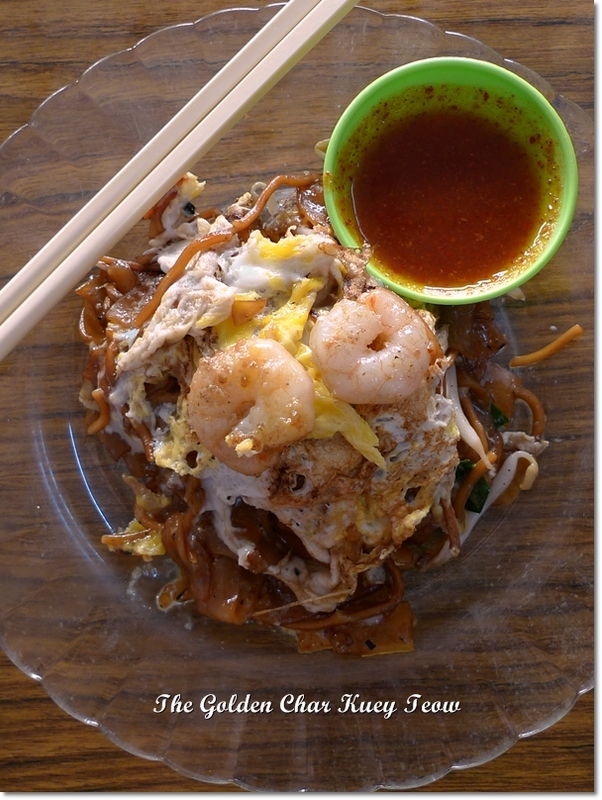 Why oh why, was this named “Kam Chau Fun” aka Golden Char Kuey Teow? Maybe because of the gorgeously wet and creamy egg oozing juices seated on top of the pile of fried noodles? OR the fact that a serving of a minimal handful of noodles with two shrimps cost RM3.50/USD1.20 per plate? Hard to say, but ask anyone about this famous ‘kam chau fun’ of old town in Ipoh, and chances are people would be torn in between. One might sing praises for the skilfully fried combination of kuey teow (flat rice noodles) and yellow mee, slightly charred from the intense frying process (it’s a skill shared by the presumably-father and son duo) then topped with the signature egg omelette with a brilliant, golden hue. Nasi Kandar @ Gerai Rahamath, Ipoh Old Town – Riots in the Making? 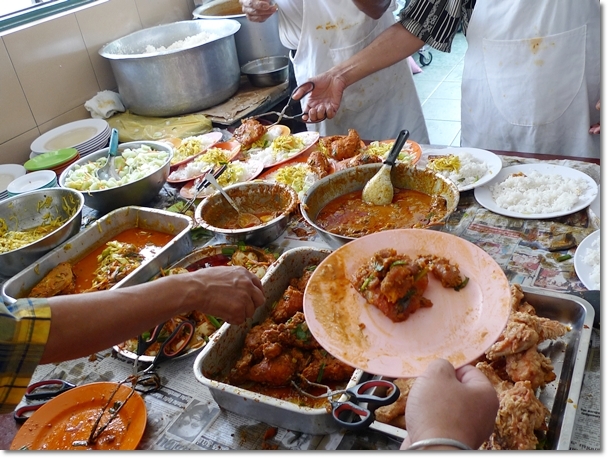 Nasi Kandar Rahman (as this stall is fondly called) – Array of curries, meats, vegetables and sambal boiled eggs. Not the most extensive of choices, but if you see the crowd in the afternoons …. you’d be amazed! Flurry of posts huh? Pardon me, folks, for I have been writing at breakneck speed lately, for fear of not able to get connected once relocating to KL (shock! horror! … thankful?!) I assume I’d be eating and not writing in the early stages. Then picking up steam as life goes on …. Or I may just jump in the fray and pick up where I have left off in Ipoh; writing stories on good street food in and around the Klang Valley. You know, the resilient spirit is hard to beat. Any better description than packed-like-sardines? Gerai Rahamath (fondly referred to as Rahman) in old town of Ipoh can easily be mistaken for just another random ‘warung’ (stall) selling nasi kandar/nasi berlauk for lunch. The difference? The horde of people swarming the pitiful excuse of a restaurant (or rather, ‘gerai’ as in stall) painted in a lovely shades of yellow and green. The place fits the Ipoh’s old town theme to a tee. To imagine a stand alone shack, located behind the state mosque in old town; an almost non-descriptive eatery that is usually best left to demolition works than granted a chance at seeing the light of day. 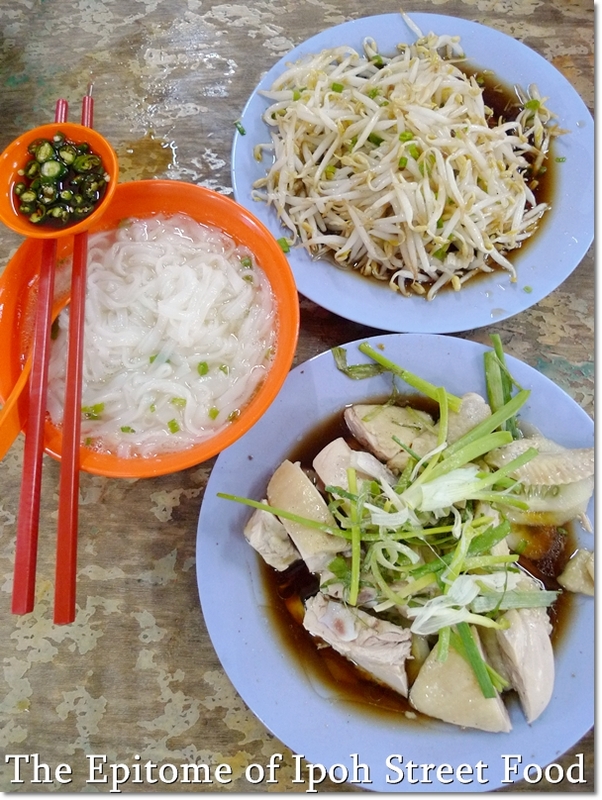 Other than the BIG TWO (Lou Wong & Onn Kee), there are still many places in Ipoh for “Nga Choy Kai” (Bean Sprouts Chicken). One example being Leong Kee on Jalan Pasir Puteh. The resurgence of interest in old timers (the previous post on Yee Jie confirmed this) around Ipoh got us back to our ‘roots’. Typical hawker fares that you would not never thought you’d be seeing the reviews on the Net, but yet ….. possess such a tight grip on your heart. 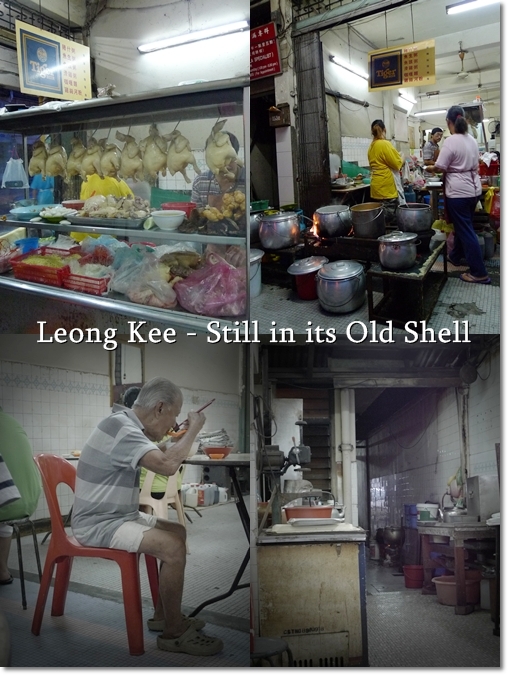 Places like Leong Kee, a shabby coffee shop on Jalan Pasir Puteh that has been around for decades; probably older than most of the Gen-Y reading this post. 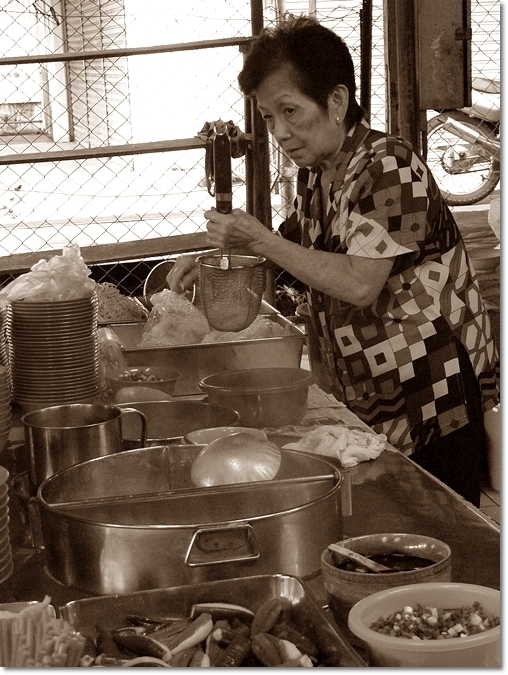 Leong Kee is famous for their porridge; especially the mixed pig’s offal porridge (Chu Chap Zhuk) and curry mee. My most immediate reaction when discussing about Leong Kee was the introduction to Sotong Kangkung; a rarely found cuttlefish salad combining blanched water convolvulus (kangkung) and cuttlefish drenched in a nutty, peanut gravy. A close cousin to the other famous Malaysian salad; Rojak, no less. Let’s take a walk down memory lane. This stall, housed in such an inconspicuous manner deep in the middle of Pasir Pinji wet market had always been a family’s favourite haunt back in the 90’s. Or maybe late 80’s? 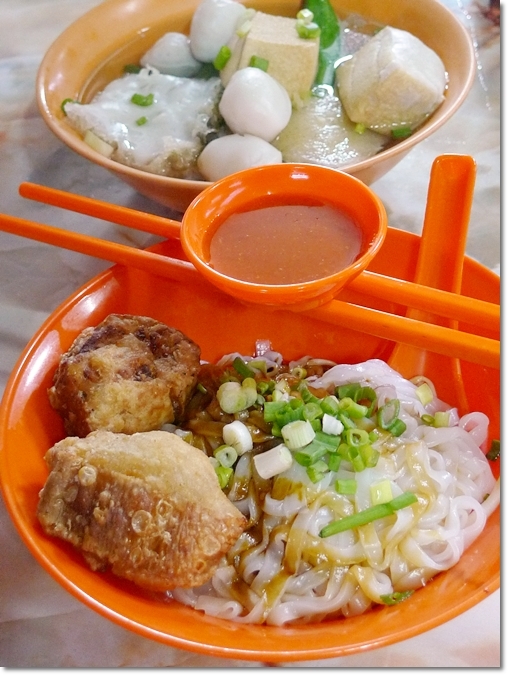 I can’t be sure, for when we were still residents around the Pasir Puteh area, we used to eat the fish ball noodles (also known as ‘kap liew’ or ‘liew fun’ to us Ipohans) here on a weekly basis. When pigging out like mad won’t cost you a bomb, an arm, or a leg. Every piece of ‘yong liew’ (more popular known as Yong tau Foo in the other states) is priced at 40-45 cents each. Back then, I never paid much attention to the stray kittens and puppies circling under our table. Nor the slight stench from the day’s offerings sold at the wet market; and the random pest or two. Only one stall was operating then; this same “Yee Jie” (translated to Second Elder Sister) stall is surprisingly still up and running. And the allure of tucking in into a bowl of soupy goodness with a myriad of stuffed fish paste as sides proves to be evergreen. The “Yee Jie” hard at work. A family business this one, the third generation of youngsters already knee deep in assisting the operations. 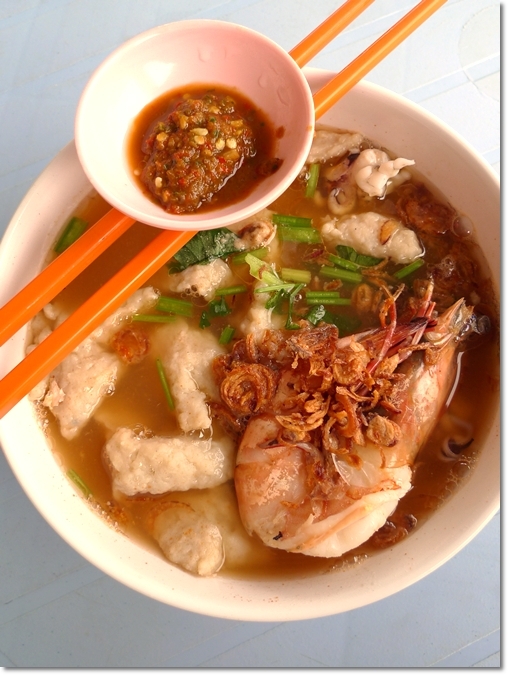 The famous Seafood Noodles (single prawn) (RM6.50/USD2.10) from Kim Keei; a household name in Ipoh since their days at their old premise near to Lou Wong/Onn Kee Tauge Ayam. Kim Kee Seafood Noodle can be touted as Ipoh’s equivalent of Segambut’s Yu Ai, minus the commercialization and branching out. I mean, aside from their closest competitor by the name of Fai Kee in Greenhill (walking distance from Excelsior Hotel), there probably isn’t another worthy contender to the crown of seafood noodles extraordinaire in Ipoh. Or you can prove me wrong by suggesting better alternatives. Truth is, I don’t usually go for seafood or pork noodles, or any form of soupy noodles unless my dining companions insist. But this time around, Kim Keei proved that they DO mean business, and the recent relocation to the new outlet off Jalan Bendahara in town centre proved to be a smart choice; away from the looming threats of Lou Wong and Onn Kee (since both these famous Ipoh’s bean sprouts chicken outlets are opened for lunch AND dinner). If this meal cost less than RM20/USD6.50, would you have rubbed your eyes in disbelief? 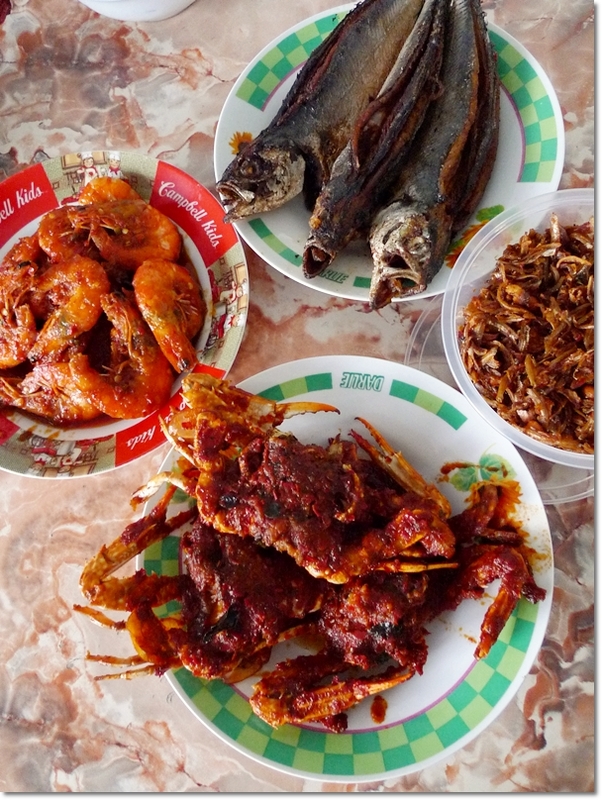 Let’s talk about good Malay food for a second. Or, seemingly, the lack of it here in Ipoh? 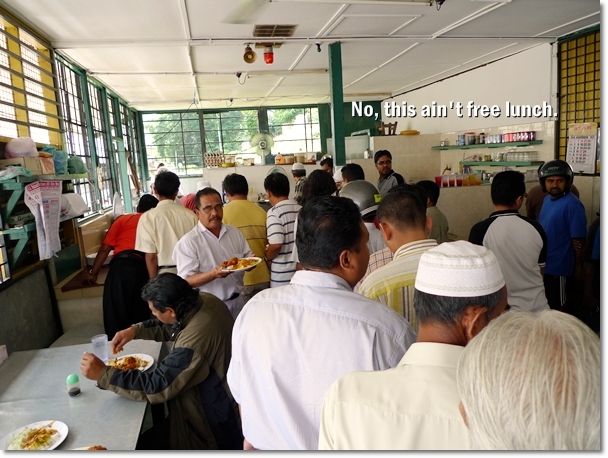 Pardon the ignorance, but save for a few worthy choices (the tried and tested outlets, as well as some highly-acclaimed stalls like the famous Nasi RM2 over at Stadium Ipoh), it has never occurred to me to do a complete Halal food run here in Ipoh. Don’t get me wrong, for I love nasi padang, nasi kerabu, nasi dagang and of course, nasi lemak just as much as I like Char Kuey Teow, Popiah, banana leaf curry rice and Roti Canai. For me, there are way too many lacklustre Malay warung (food stalls) out there in Ipoh; serving the ever-so-generic Malay-Thai style Tom Yam, nasi daging merah, telur dadar and such. Why not start from here?